The April, 24 is celebrated worldwide Fashion Revolution Day, a call to action about sustainable fashion and a tribute to more than thousand victims of the catastrophe of Hotel Rana, which occurred two years ago in Bangladesh. Humana joins Moda Sostenible Barcelona Association in organizing a big event in Barcelona, ? ?coinciding with the day. It is a performance in the Plaça dels Angels, opposite the MACBA museum, with which you want to show the amount of clothes we throw away each year. The action includes a large installation consisting of 400 kilos of clothes, which were formed on the floor lyrics FRD (Fashion Revolution Day). These 400 kilos of textiles used come from our plant classification of L'Ametlla del Vallès. Prior to the performance against the MACBA, will be held a parade through the streets of Barcelona, ? ?in which participants wear garments produced in a sustainable way, including resale. All citizens who wish may join this parade and the accompanying slogan: 'Who made my clothes?' 'Who has made my clothes?' Very soon we will reveal the point and time of meeting on the afternoon of April, 24. Humana joins this event as part of its ongoing campaign to raise awareness of the importance of promoting reuse and sustainable fashion, as an alternative to Fast Fashion. The most sustainable garment is already produced, so second hand fashion fits perfectly into this philosophy of sustainability. 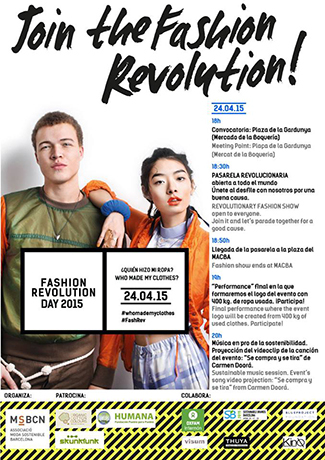 But the Fashion Revolution Day is not limited to the activities of April, 24. Social media is key in spreading this call for sustainable fashion, so under the hashtag #WhoMadeMyClothes, #FashRev and #RetoModaSostenible can find many examples of how citizens are mobilizing for the event. On the other hand, Sunday, 26. Humana is participating in the so-called The Sustainble Sunday, in Centre de Cultura Contemporània de Barcelona CCCB. It is part of Sustainable Brands Barcelona and comes to share a day with citizens engaging in activities around sustainability. Includes a special section dedicated to sustainable fashion. Humana participates as a speaker so-called PechaKucha: The originality of this format is that each speaker has to expose your subject line using 20 slides, each of which is only shown for 20 seconds.